JACKSONVILLE, Texas – Teamwork is a major factory in the success of any operation. Pete Carr knows that as well as anyone, and it’s why he has the utmost confidence in the staff that will help Pete Carr’s Classic Pro Rodeo and Carr Pro Rodeo in producing the Tops in Texas Rodeo, set for 7 p.m. Wednesday, May 15-Saturday, May 18, at Lon Morris College Arena in Jacksonville. “I’ve got the best crew going down the road, bar none,” Carr said. It shows in the overall product. Both firms have been recognized as top livestock contractors in the Professional Rodeo Cowboys Association, and Carr points to the staff as the primary reason for any success. Every play has its lead performers; in Carr’s case, those are some of the greatest bucking beasts in ProRodeo. Without an outstanding crew backstage, those performers won’t be showcased in the right light. The philosophy is the same in rodeo. 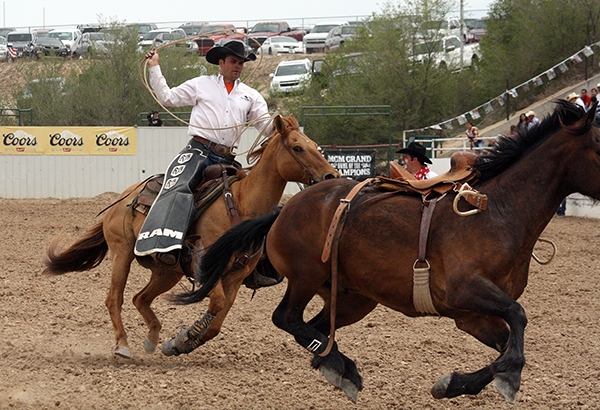 Carr established Carr Pro Rodeo in 2005 and purchased Classic Pro Rodeo this spring. Now Carr has brought together the teams from the two companies to form something rather magical. “We’ve got some guys like Travis Adams that have been working for us for 20 years, and we’re mixing that with younger guys who work hard and are eager to learn,” said Jeremy Hight, a cowboy from Carthage, Texas, who is in his fourth year serving as a pickup man. This year’s Tops in Texas Rodeo will be the fourth for Hight, one of two pickup men in the arena. The pickup men might be the most important cowboys in the arena throughout a rodeo, but it’s best that they’re not recognized. Their primary tasks are to keep cowboys as safe as possible while also helping with the overall production. They knew the necessity of getting the animals out of the arena in quick fashion after each ride and run. The behind-the-scenes staff members put their blood, sweat and tears into their work in an effort to make each run, each ride and each performance come off as flawlessly as possible. Whether it’s feeding the animal athletes or moving them into the chutes to perform, there numerous tasks that need to be accomplished in order for a rodeo to come off without a hitch. In addition to the family entertainment, crew members also keep in mind that this also is a competition featuring the brightest young stars in the sport.